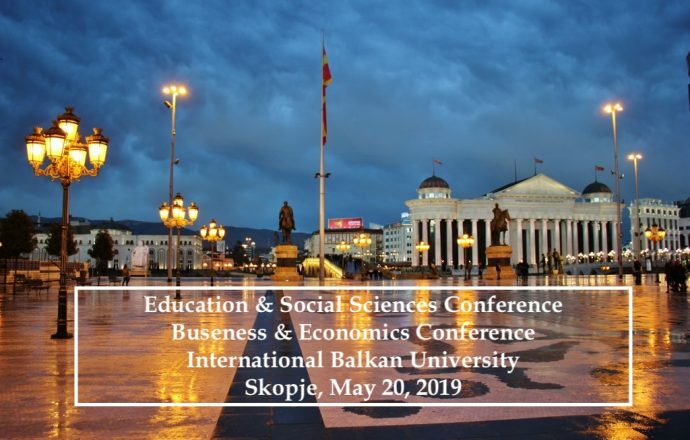 International Academic Institute (IAI) has the honor of inviting you to participate in the International Academic Conference to be held on Monday 20 May 2019 at International Balkan University in Skopje. The IAI Conferences provide a platform for academics, researchers, and Ph.D. students to contribute with their papers on topics related to education, humanities and social sciences, business and economics. Submission Deadline for Final Paper you would like included in the conference proceedings by September 1, 2019. The registration fee includes access to all sessions, conference kit with program and other materials, coffee break, publishing (Book of Proceedings: ISSN e-book and Book of abstracts: ISBN e-book) and certificate. Payment: Upon issued invoice by IAI (after notification of acceptance) or directly to the following link. Abstracts: Maximum 300 word abstracts can be submitted by email to staff@ia-institute.com. Abstracts should be written in Word or RTF formats, font Times New Roman size 12, following this order: author(s), affiliation, email address, title of abstract, body of abstract, 5-7 key words. A short biography (up to 100 words) is also required. Notification of Acceptance: Within 3 days of receiving your proposal/abstract or full paper, we will contact you for a notification of acceptance or rejection. If your paper is accepted, additional conference and registration-specific information will be included.All accepted papers/abstracts are double-blind peer-reviewed and will be published in our online conference proceedings and book of abstracts. The working languages of the conference are English and Macedonian. The conference welcomes both paper and poster presentations by scholars and professionals from any discipline including but not limited to economics, finance, management, law, political science, international relations, security studies, environment, sociology, information science, medicine, engineering, education, media, liberal arts, language, film, literary and cultural studies. PhD students are particularly encouraged to take part. Paper presentations: We welcome papers of maximum 4500 words. We will consider papers written by a maximum of three authors, and not more than two papers of the same author (regardless whether she or he appears as first, second or third author). A selection of most relevant papers will be considered for publication in a special Edited Collection from the Conference in Cambridge Scholar Publishing. Virtual presentation (e-session):If you cannot attend our conference but still wish to have your paper presented, we offer an E-session for your convenience. Your paper will be presented electronically for viewing and discussion using Microsoft PowerPoint with narration (voice-over). However, you are still required to submit a proposal/abstract or full paper and one author has to pay the registration fee. Participants are responsible for their own travel and accommodation booking and expanses.